A couple of years ago, by which I mean back in 2006 and whoa does it make me feel weird that it feels so recent ack I’m getting old, we had a year with a glut of movies about magic. By which I mean that we had two whole films purely devoted to talking about stage magic, specifically in the late 1800s. Weirdly exact, but whatever. Of those movies, we only really held onto The Prestige, probably because it’s a lot better than The Illusionist. Still, those two movies sparked a little bit of a revival of stage magic. Oh, people have been going to see magic shows for years, I assume, but this was when magic came back into the limelight of pop culture. At least it came back as much as stage magic ever comes back. There were Penn and Teller specials on HBO. TV shows featured episodes with magic in them, and countless novels were published about down on their luck magicians in the Dust Bowl or Atlantic City, or otherwise slightly romanticized places from American past. Crap, even Oz the Great and Powerful was about a stage magician from Kansas. But for all of that, we didn’t really get around to talking about what magic means today. These days, stage magic isn’t so much the top hats and velvet cloaks, at least not outside of kids’ birthday parties. It’s slick, cool, clean, and something that happens in giant stadiums in Vegas. Again, I assume. I’m not actually a huge (or even a minor) fan of magic, but I am vaguely aware of its existence. 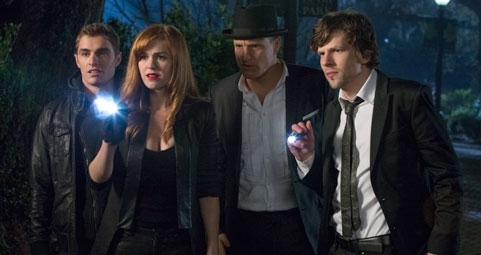 And here comes Now You See Me, a movie about modern magic. Cool magic. Magic that happens because of really incredibly high tech smoke and mirrors. Unfortunately, for all that magic has advanced in the popular culture since The Prestige, the basic principles haven’t, and therefore this movie falls flat. It has no prestige. But let me back up and explain. Now You See Me came out early this summer, had a pretty decent box office run, and neither ruined nor made the careers of anyone involved. 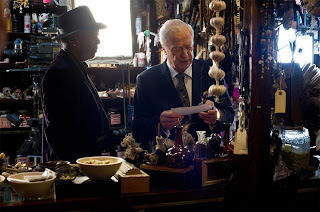 Featuring an ensemble cast that mixes newcomers with heavy hitters, the movie is about modern stage magic, social upheaval, and a decades long mystery. Or, at least, it should have been. 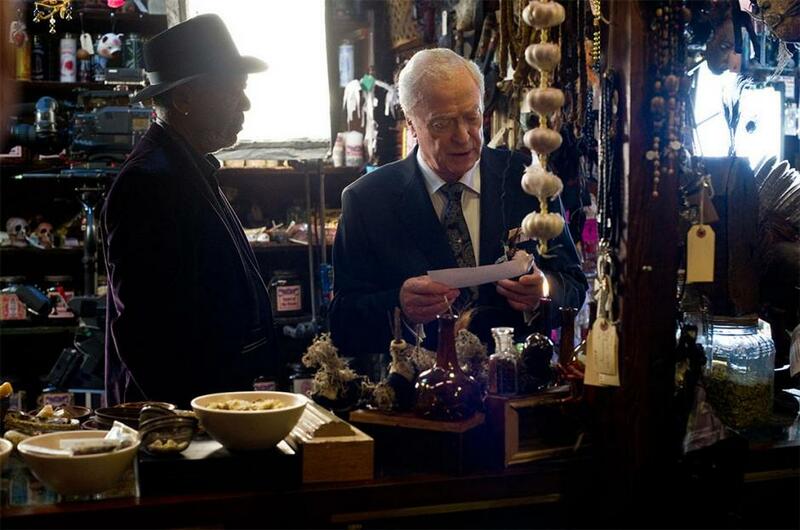 The film follows four stage magicians who’re all talented but undervalued. 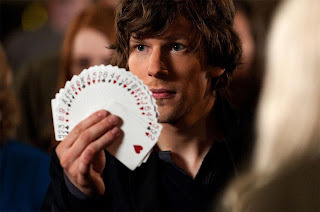 J. Daniel Atlas (Jesse Eisenberg) is a classic stage magician. Card tricks, sleight of hand, and rabbits. 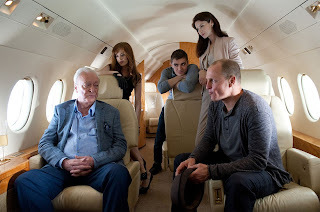 His former assistant and now rival, Henley Reeves (Isla Fisher), prefers escapism. Literally. She’s an escape artist whose first appearance finds her trying to escape an underwater cage before piranha’s are dumped in. Merritt McKinney (Woody Harrelson) is a “psychic and hypnotist” or a cold-reader, who had a brush with fame early in his career, but now makes his living performing at country clubs and blackmailing philandering husbands. And Jack Wilder (Dave Franco) is a bland, kind of boring pickpocket, who plays exactly the same role Matt Damon had in the first Ocean’s Eleven. They’re all magicians, and they’re all bumming along, not living up to their potential. That is, until they all get an invitation to a mysterious apartment building at a specific time. And in that apartment, where they all meet, they are greeted not with a person, but with a set of specs. Specs for a show. The greatest magic show anyone has ever seen. Fast forward a year later and they’re putting the show on in Vegas. Calling themselves the “Four Horsemen”, they’ve got a wealthy sponsor, played by Michael Caine, a sold out crowd, and a plan to blow the roof off. That plan? Rob a bank during the show. How? Magic. This is where the story really takes off. Because a bank does in fact find itself robbed, and the money somehow makes its way into the theater and drops down on the audience like confetti. Claiming that they’re trying to help their audience recover from the hard times of the economic crash in 2008, the Horsemen set themselves up as folk heroes and champions of the underclass, all while escaping prosecution because, you know, magic. Unfortunately for them, there was a magic debunker (Morgan Freeman) in the audience that night, and he’s perfectly happy to tell the FBI how it happened. 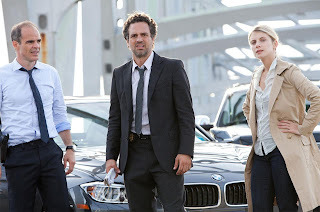 The FBI team, Dylan Rhodes (Mark Ruffalo) and Alma Dray (Melanie Laurent), are an odd couple the nth degree. Rhodes is gruff and unhappy. He hates magic, hates that he’s investigating it, hates that people pay to go see it. Alma, on the other hand, loves magic. She thinks it’s romantic and sweet. Clearly they’re going to fall in love. Rhodes and Alma chase the Four Horsemen to New Orleans, where they do a second show. Once again, the Horsemen pull off a heist, only this time, they’re actually robbing from just one person: their benefactor. Mr. Caine gets to put on his angry face, only to be mauled by the horde of indignant audience members. Seems the Horsemen are playing a specific game here, and managed to seed their audience with people who failed to receive insurance claims after Katrina. Mr. Caine’s character was the head of the company that denied those claims. Ergo, justice is served. Sadly Agent Rhodes disagrees, and tries to chase down the Horsemen once again to arrest them. (I forgot to mention that he arrests them earlier in the film as well, only for it to come to nothing.) They get away, and he goes back to the drawing board. But wait! Ordinary detective work will bring this one in. They find the Horsemen’s base of operations in New York City and arrange a raid. The place is pretty much trashed, but Jack has stayed behind to burn some papers, and a great chase scene ensues. Jack dies in a car crash, Rhodes feels intensely guilty, and some papers are pulled from the wreck that may tell us what’s going on. Oh, and the Horsemen reveal that they don’t know why they’re doing this, only that they have one more show left and they have to complete it or else they won’t get to know who’s pulling the strings. I’m not going to go into the details of the final show, or what happens after or any of that, but I will say that it’s all overblown and melodramatic, and then suddenly, shockingly, over. Throughout the film there are little threads of mystery. Alma thinks that the Horsemen are doing all of these stunts in order to gain entrance to The Eye, an order of stage magicians that is revered for being the highest honor bestowed on a magician. She also thinks that the case is related to that of Lionel Shrike, a magician who drowned thirty years ago while performing a stunt. Alma is, as it turns out, completely right. In a shocking turn of events, Rhodes is discovered to be the man pulling the strings all along. He’s been sending the Horsemen their instructions, keeping the cops off their backs, and even going so far as to frame Thaddeus Bradley (Freeman) for their crimes. Everything he’s done has been to get revenge for Shrike’s death. Because Shrike was his dad. The bank they hit? That bank and the other insurance company refused to pay out when Shrike died. They also take out a safe company that made the faulty safe that caused his father to drown. And, of course, he has to get revenge on Bradley, who made his first brush with fame by debunking the magic behind Shrike’s show, and putting him on the path to an accidental suicide. It’s all very poetic, really. Alma doesn’t turn Rhodes in, and instead they kiss. The Horsemen find out that Rhodes was behind it all along and are suitably impressed. Rhodes informs them that they are now members of The Eye, and everyone rides the merry go round together. I didn’t make that last part up. They really all smile and laugh and ride a merry go round at the end of the movie. So maybe you can see where I’m going with this, but I want to make it clear that I don’t think Now You See Me is a bad movie. It’s not. It did quite well in the box office, entertained me sufficiently, and when the sequel comes out, I will go see it. It was cute and sweet and fun. But it’s not exactly great, is it? You see, the thing about movies and the thing about magic is that everything hinges on the ending. You have to stick the landing. Throughout Now You See Me, everything feels like it’s building towards the end. There are all these mysteries, these hints, moments when you think something big is coming. Is Alma secretly in on it? Is she really Interpol at all? Is Jack actually dead? (The answers are no, yes, and no, respectively). The trouble is that when you get to the end of the movie, it’s too easy. It just ends. Oh, they were doing it all because someone promised them that they could be members of a super special club. Oh, he’s doing it to avenge his father. Oh. There’s no great class uprising secretly at work, no sinister side of the plot. It’s good people getting justice for stuff. Not awful by any means, but it’s not really rocket science either. And that’s fine. It’s a perfectly good movie. But it’s not great. It’s not The Prestige. What made The Prestige amazing, what made it the movie that everyone remembers and that made magic cool again, was completely and entirely the ending. Be honest. When you think of it, that’s what you think of. That’s really all you think of. I mean, there’s more to the film than that, but the ending, with Hugh Jackman and the tanks, that’s what you remember. With good reason, too. The whole point of the movie is that ending. The whole point of a magic trick is the ending. The beginning is just to get you invested, the middle is just to confuse you, but the end. The end is where you get to be amazed. Only Now You See Me isn’t amazing. It has potential, don’t get me wrong. Apparently in the sequel they’re going to go more into what the crap The Eye actually is, which would be good. In this movie it’s just the macguffin to keep our characters going, and means absolutely nothing whatsoever. It’s a merry go round ride and a big smile. That’s all. And the mystery about Lionel Shrike is cool and all, but I was kind of hoping he was secretly alive and this was his long trick or something. This was a bit disappointing. Now You See Me is a movie about magic, but I don’t think it’s a movie that actually understands magic. If it did, the ending would be a lot different. 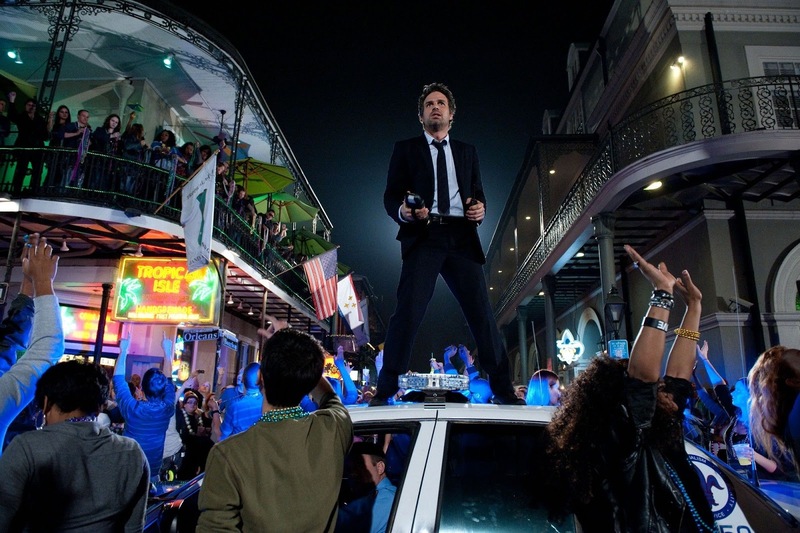 You can’t build up and fizzle out in a magic trick, and you shouldn’t do it in a movie either. The point of the movie seems to be how the characters get from point A to point B, but that shouldn’t be the main feature. The feature should be the end, like The Prestige or Ocean’s Eleven. It should be a reveal, a gasp, a moment of recognition. Like I said, I’ll definitely go see the sequel, and I did enjoy this a lot. I just seem to think that a movie about magic should be a little more, well, magical. SPOILERS AHEAD - DON'T READ IF YOU HAVEN'T SEEN EITHER OF THE TWO MOVIES. I think I was more stunned after watching Now You See Me's ending than The Prestige, to be honest. I never saw that [Rhodes as the guy behind it all] coming. The Prestige, however, was a different thing for me. I knew that Fallon and Borden were swapping as it was really easy to see that Fallon was actually being played by Bale (not so hard to figure that out). However, having said all that, I believe that The Prestige was a better film because of the way it folds out and the way it was directed. To each their own. Personally, I never made it to the end of The Prestige. It bored me and I found all of the characters completely unlikeable, so I turned it off...which is pretty shocking, if you knew how much I love Christian Bale and Hugh Jackman. *shrugs* And really, Now You See Me is pretty much a set up movie. The idea is that the Horsemen are now part of the Eye and will go forward and fight for justice and to protect what magic should be, as defined in their last show. That's funny. Yeah, I think it really does come down to personal taste. Because I love the ever loving crap out of The Prestige, and I just did not get this movie at all.